Choose three- or four-inch plastic pots. 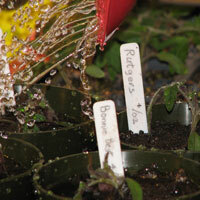 Fill the pots with a soil mix similar to that used for seed germination or regular potting mix. Remove the seedling carefully from the seed flat. Cut out with a spoon or dull knife if necessary to keep the root ball intact. 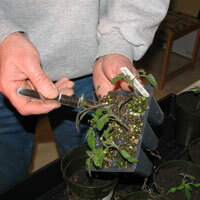 A small Rumford seedling tool may come in handy for lifting seedlings from flats. 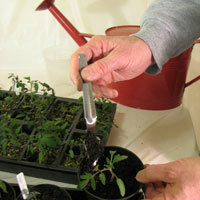 Rumford makes several small quality tools for handling plants in small containers. 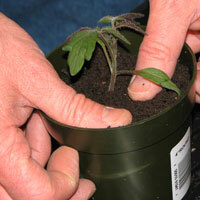 Plant the tomato seedling in its new pot, holding by its leaves or root ball, rather than its delicate stem. Press down on the soil gently around the rootball. Water well then allow the plant a couple hours to adjust before setting back in the sunlight or under the lights. Fertilize, water, and provide light as before until the plants are eight to twelve inches high and seven to eight weeks old. The tool I'm using is part of the The Rumford Gardener Mini Indoor Stainless Steel 3-Piece Garden Tool Set which is available at Amazon.com.